Many mascots use stilts in costume while performing for visual effect. The most common stilt solution is a "dry wall stilt". These stilts are used by professional housing contractors to hang and finish walls and ceilings. Drywall stilts have a flexible foot system that makes them more comfortable to walk and wear. Gameops.com would recommend an adjustable stilt that extends up to 40". Smaller stilts obviously have a smaller effect. Stilt walking like any skill, takes practice time and practice time in costume. Your results may vary. After selecting and purchasing drywall stilts, most mascot performer create custom pants to cover the extended leg, adding to the illusion of long legs. These custom pants can be made by extending a large pair of pants or custom-making entire pants. 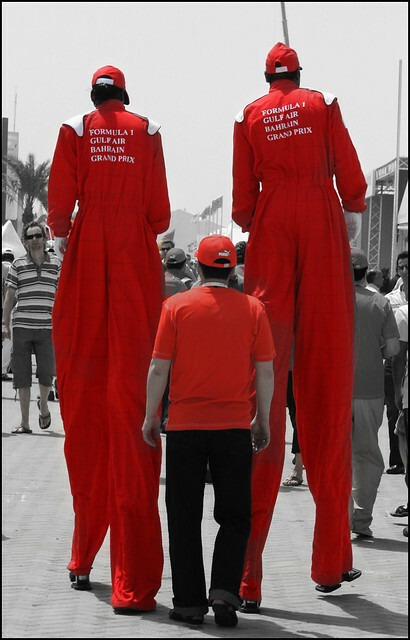 Here is an example of a performer on stilts with the stilts covered with an adapted pant.